Common Man Brewing keeps it modest: “we are just a couple storefronts east of the Family Dollar” is how they describe their location in Ellsworth, both Pierce County seat and the Cheese Curd Capital of Wisconsin. The “nanobrewery” started out in 2015 and their restaurant grew so fast they had to hold off on releasing their own beers. 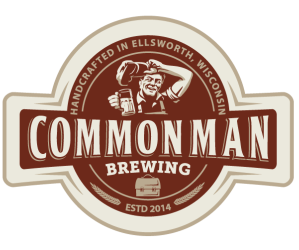 While they gear up for brewing during the winter of 2017-2018, Common Man currently offers 22 beers on tap from around Wisconsin and the region. Common Man also serves cocktails and has an awesome food menu, including burgers so popular they’ve been featured on the Discover Wisconsin TV show. The menu also features fairly unique foods for small-town Wisconsin, like Korean Kimchee Fries. And don’t think the presence of Ellsworth Cooperative Creamery just down the street doesn’t affect the menu here, too! You’ll find Common Man Brewing right along U.S. 10/63 in Ellsworth, just east of downtown and not far from Highways 65 and 72.